Last year was busy, crazily so at times, and there was no time for pondering projects. Just one commission which I've mentioned before. A cube-shaped bookshelf of seven mini board books of rhymes, Ma Petite Bibliothèque de Sept Comptines à Chanter, published next month withBayard. 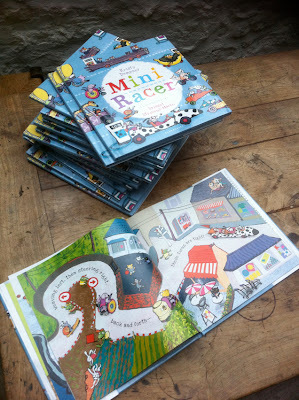 My illustrations to Mini Racer by Kristy Dempsey, are also due out in February 2011 but they were mostly done in 2008-9. I've talked already about clearing out my parent's home. Many of us have to do that at least once in our lives. Are we ever prepared for it? I groped for some kind of structure for dealing with it all. First I archived my father's paintings. In his very limited spare time, Mick helped me put online a web site I wrote about my dad's work. But I had to tackle the real physical stuff by myself. My father's wall-to-ceiling bookcases of dusty old tomes nearly undid me. I thought of old Soames in the Forsyth Saga, killed by a bookcase falling on top of him. I gave myself a deadline, setting sights on a a time when I'd be free from some of the weight. Auctioneers, a local charity, and clearance people came for the final haul. I had never appreciated what an essential role such people play in the human ecological cycle; excavating, digesting and recycling for other lives. And what a lot of stuff there was - half a century of my father and mother's lives, both makers and hoarders in their very different ways. I kept asking myself, how much more space is there in our world, to fill? Anyway it got me thinking about creative processes and how much it's about sorting out, structuring, giving meaning, throwing away, bringing to life. Our shrinking spaces may be one reason why increasing numbers of contemporary artists work with archives. Rather than generate more stuff, they sort. They take some aspect of the pre-existing stuff, and invent new structures for ordering it, creating new meanings for what's already there. And I thought about how small kids learn from structures, and want order almost more than they want information, at kindergarten. "Chaque chose à sa place / Everything has its place" my kids were told, encouragingly, in French maternelle school from aged 3. ("If only that were true!" I sometimes think...) But how kids love putting things in boxes, laying out bricks or plates, fitting one lego onto another - and breaking the order and re-inventing it too. 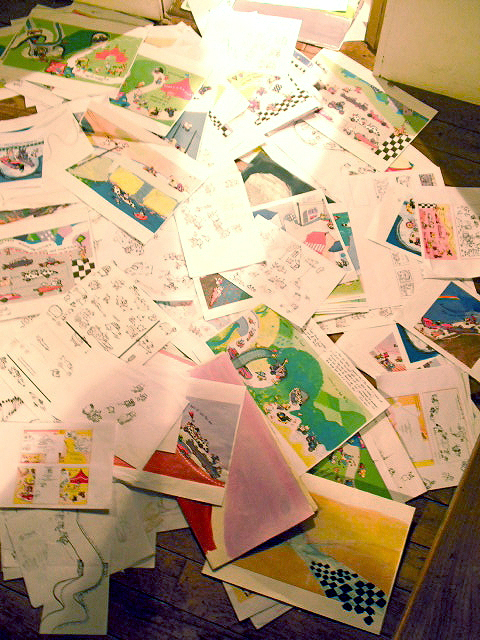 I've sorted and kept about a quarter of this 'archive'. A lot has gone into paper recycling. Really the whole process is all about making messes and sorting them out. I was delighted to receive last week my pile of advance copies of the US edition. In a real sense, it's a re-ordered fragment of the mess above, condensed into a coherent, beautifully-designed and bound 32 page fly-leaf hardback. And bravo to all involved in helping make that happen from the first words that Kristy put on a page to send to her agent, to the editor, art director, designer, printers, not to mention the distributors and the guy who packed the box and the delivery man who knocked on my door! But now I have to find a space for them in my house. Better get back to excavating papers on my desk and drawing table - a repetitive task which I never quite get to the bottom of....Deskavation - a new word proposed by a listener to Broadcasting house on BBC Radio 4 today. Introducing SketchJam: Sketchbooks & Beer!